Although Paul Abraham Dukas (October 1, 1865 - May 17, 1935) lived a long life, his principal musical contribution is limited to just a few works, among them only l'Apprenti Sorcier (the Sorcerer's apprentice) has remained popular. 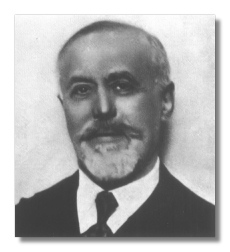 Dukas was born in Paris to a Jewish father and French mother who played the piano and was an important early influence. He attended the Conservatoire de Paris where his teachers were Théodore Dubois, Georges Mathias and Ernest Guiraud. It was in Paris that he became friends with the composer Claude Debussy. His surviving compositions are few. Dukas was his own harshest critic and abandoned many projects, destroying all his unfinished works except for a few smaller pieces and sketches. Of the piano works that survived the outstanding pieces are the Piano Sonata (1900); Variations, interlude et finale sur un thème de Rameau (1902); Prélude élégiaque sur le nom de Haydn (1906); and La Plainte, au loin, du Faune (1920). His orchestral works are better known. In addition to the The Sorcorer's Apprentice symphonic scherzo (1897), the Symphony in C Major (1896); Villanelle for Horn & Orchestra (1906); the ballet "La Peri" (1912) have remained at the periphery of popularity. The Sonnet de Ronsard for Voice & Piano (1924) and his opera Ariane et Barbe-bleue (1907) were also important contributions. In particular, Ariane et Barbe-bleue brought Italian opera aesthetics to France. Dukas succeeded Widor as professor at the Paris Conservatoire in 1928. There he became well known as a teacher of composition with many famous students, including Joaquín Rodrigo, Maurice Duruflé, Olivier Messiaen, Manuel Ponce, Jehan Alain, Jean Langlais, Jean Hubeau and Yvonne Lefebure, Joaquín Nin-Culmell.